Before we could get over the Halloween festivities, another exuberant and beautiful festival comes knocking at our door. The festive season has begun and we cannot wait for the next celebration, i.e. Thanksgiving. It is a day to be thankful and grateful for what we have and to spend time together with our family and loved ones. The delicious treats and family get-togethers make this one of the most awaited festivals in the USA. 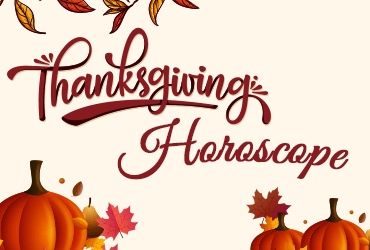 To make your Thanksgiving all the happier and merrier, and to give an inspirational twist to it, we bring you Thanksgiving Horoscope 2018 as per your Zodiac Sign. Want to know what the stars have in store for you on this festive day? Let’s find out! It is never difficult for you to win people’s affection and maintain relationships. However, this month could be a bit challenging for you in this respect. So, make it up for the same this Thanksgiving. Do the honors of hosting a party at your home or even in your garden. Decorate it in your characteristic fiery style, invite your friends over and have a gala time. You do not like to be on the edge, Taurus. Being comfortable is your best space and you will be looking for just that this month. But, you will have to move out of your comfort zone and take the risk. So, this time celebrate a Thanksgiving where you can relax a bit. We all know the perfect host that you are and how you love to cook the Thanksgiving dinner, but, let’s do things a tad differently this time. Take your entire family to dinner at their favorite place or maybe go to a resort and just chill and have fun with your loved ones. You would want to revisit your old days by doing an activity which brought a smile to your face. And, there cannot be a better occasion than #Thanksgiving. You always want a fun and crazy party, so be that party host this time. You could organize some games and activities such as painting or volleyball or whatever that makes you happy and enjoy it with your family and friends. You are a homebody, Cancer. So, the festive time is probably the most favorite time of the year for you. You like to stay at home and need that downtime every now and then. Moreover, you love to host family-get-together. So, Thanksgiving is your kind of festival. You are going to host this year’s party and will even sort the family drama that is going on for some time. It is going to be a busy and hectic time for you! Like always, you would want to lead and succeed this month, as well. However, things might not go in your favor this time. Thanksgiving is your time to cool off. You might plan a getaway with your family on this long festive weekend or even go for some adventurous activity. It is going to turn out great and you will return all rejuvenated and energized. You tend to worry a lot and analyse even the minutest detail. But, this Thanksgiving your family is going to see a different side of you. You will let your hair down and spend a gala time with your loved ones. Nostalgia will hit you badly and you will spend the entire evening reminiscing the good old days. You will also do some charity and donation to give more meaning to this festival. This month, your focus should be to prioritize. Check your financial goals. Celebrate but keep your budget in mind. Do not go overboard in doing things. You should spend your Thanksgiving at your family’s rather than hosting one. Discuss your plans and goals with your immediate family. You might get a tip on how to do things effectively. You are high on life right now and are not leaving any stone unturned to make this Holiday season a grand one for yourself, at least. You are going crazy shopping and preparing for Thanksgiving. Your focus is to enjoy this festive time to the fullest. Also, you are going to surprise your family in the most unexpected way. Have fun! Your last Thanksgiving was a bit hectic as you were busy with some important projects. But, this year, your loved ones will witness the same warmth, optimism, and cheerfulness as you host a grand party at your place. Things are much brighter and better for you now. And, you will celebrate your success to the fullest. You might finally stumble upon the stepping stone you need to march forward in your career. Things look quite bright for you. Although you might be solving certain issues this month but it will not dampen your Thanksgiving spirit. You will celebrate this festival in your characteristic traditional way. It is an opportunity for you to spend some quality time with your loved ones which you were not able to get for a really long time. You are all motivated and inspired in this festive month. And just like always, you would want to do things differently on Thanksgiving. You could throw a unique theme based party or give an unexpected surprise to your loved ones. You are not worried about taking any big decisions or solving any big problems, so, you can just put your feet up, relax and enjoy every bit of the festivity. You will be the center of attention, Pisces. Although you are shy, but, you will surely love this appreciation and recognition coming your way. Contrary to your personality and taste, you are going to bring some quirk in your Thanksgiving celebration. It could be the decor or your dinner or your presents. But, whatever you do, it will be loved and admired by everyone around. We hope you have the most splendid time of your life, this Thanksgiving. Want to know how your love life is going to be on this day? Check your love horoscope now.